Digital Audio Sound Quality also effects on your personal & business life . There are many kinds of Audio softwere/Hardwere and plugins available to boost profestional high quality studio level sound. Audio softwere is major part of Sound Production studio platform. you can not get profestional high quality sound by audio softwere only. you need to sound hardwere also like best quality mixers, Microphones and Sound Cards. Audio softwere give you realtime editing mixing and recording sounds interface. Pro Tools is the most famous profestional audio Softwere which is developed by Avid .Pro Tools give you wide range of sound recording and sound production features. Pro tools recomanded specific Sound Card(Hardwere) only like Digidesign Rank and M-Audio Sound card only. you can not use this softwere with any sound card hardwere. Pro tools may be some highly cost but it's best Digital Sound Workstation for Profestional Sound Studios. Before 15 year ago 16 and 24 sound station was famous but now days all profestional studio using this Audio softwere at nepal for audio production. Cubase/Nuendo is useful audio editing recording mixing softwere which is developed by Steinberg. Cubase/Nuendo Provides faster audio editing and exporting features. tipically Cubase/Nuendo very useful to Movie Voice/sound Dubbing for movie studio because Cubase/Nuendo export(Bounce) audio clip very faster. Bacically this softere useful to Sound Designer/Music Arranger. Cubase can be link with Reason sound pack softwere for high quality midi raws sound. adobe Audition is a digital audio Softwere which is developed By adobe system. Nnon-destructive mix/edit timeline, Multitrack, and a destructive-approach waveform editing facility is the special features of Adobe audition. You can Dynamic Link Adobe audition to Video editing softwere Adobe Premiere Pro. Sound Forge Audio softwere delivers Powerful the goods whether you are recording creating sound effects for you. 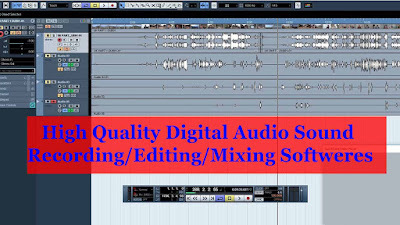 it is very easy to use and editing recording Audio Sound footage. Sound Forge audio softwere developed by magix ag. Cool Edit Pro Audio Softwere is an advanced multi track sound editing Workstation. it has some extra special Sound Filters Effect, Plug-Ins capability Multi track working function, and batch process the audio files. which is distributed by soft32. Audacity is a free version of digital audio editing & recording software. You don't need to pay for this softwere. Audacity also an easy-to-use, multi-track audio editor. developed by a group of volunteers as open source. first version of audacity was released 18 years ago on May 28, 2000.